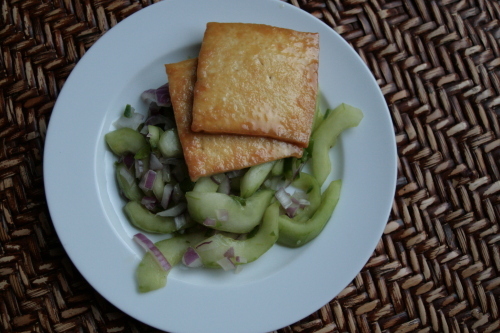 Everyone should know how to cook tofu, and the tastiest way is also one of the simplest. First, something to remember when first learning how to cook tofu: All Tofu’s are NOT created equal. Don’t be afraid to shell out an extra $0.79 for the better brand, extra-firm variety. The wrong tofu will simply turn into mush on your frying pan and you will be left with nothing but gooey bitterness for you over-zealous frugality. ONce you have the right ingredients, however, you’re ready to make a delicious and super-healthy dish! Begin by drying the tofu block and cut into 3/4-inch cubes. 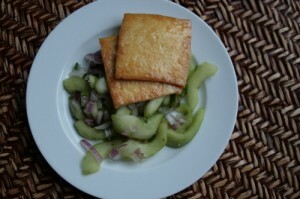 Pour 2 tablespoons oil into a skillet, heat to medium, and cook tofu, turning occasionally, until golden brown. Use a slotted spoon to transfer to a bowl and toss with 2 teaspoons soy sauce, or 1 tablespoon of your favorite stir-fry sauce. Garnish with crumbled seaweed or grated fresh ginger. You can also use the remaining oil in the pan to stir-fry some add-ons. Broccoli, scallions, edamame, spinach and other fresh, flavor-rich vegetables add essential vitamins. You can also serve the tofu and stir-fried vegetables over ramen or in miso soup. Tea is a good beverage match, and cold beer is a special treat in warm weather. No matter how you serve it, protein-packed tofu will satisfy your hunger without leaving you with a too-full feeling.